"The quality of our life is based on the choices we make." This entry was posted in awareness, boundaries, choice, clarity, knowledge, manifesting, reminders, seeds, value systems, wisdom on 25 February 2014 by Martina. Last fall I was struggling with something that seemed overwhelming to me. So, naturally, I sought advice/coaching/guidance. Most of what was discussed was a validation of things I already knew or felt, but needed reminding. (yay!) As a result, some seeds were planted or watered. But there were some suggestions that were new to me that felt “off.” However, because I had sought out some of the best intuitive people I knew (and because I spent good money on those coaching sessions), I felt inclined to listen and believe what I was hearing as 100% truth. Imprinting done. The suggestions given to me, because I accepted them into my reality in some way, were now imprinted on my psyche and my intuition, whether they belonged there or not. It wasn’t until a couple months later that I was discussing it with a dear friend who brought up the subject of imprinting. In essence I had allowed someone else’s truth to become imprinted in my reality and, even worse, my imagination: the source of my manifesting and creative abilities. Oops! There is no malice (usually, hopefully) in imprinting. In fact, it’s typically based in an effort to help. But there is a difference between imprinting and seed planting. I have often described myself as a seed planter. With my clients, in my writing, and in my workshops, my goal is to share seeds (aka: ideas) that may (or may not) take root in each person’s individual soil. The seed will only take root if the soil is ready (ie: the client thinks the seed is good for their garden). Imprinting also is about sharing, but it takes it a step further. Imprinting leaves an indelible, yet invisible, mark on the ground where it’s placed, because it’s already a seedling, growing and taking up space. It also uses some level of “truth-telling” and “expertise” as its fertilizer to take root. It’s not insidious, though. It simply is what it is. The main difference, therefore, lies within the recipient. In seed planting, the recipient feels entirely in control over what is allowed to go into their garden. A seed will validate or remind them of something they already knew, intuitively. In imprinting, the recipient has relinquished some of that control, or authority, over themselves and their soil. A seedling has been planted with an established root system, and it takes up space and changes the soil. We all do it. I did it. Someone we esteem (or hire) has said something to us, based on their wisdom/experience/knowledge, therefore it must be true (even if it doesn’t feel 100%). Imprint done. The big question to ask is: is it bad? What I am saying is: don’t allow others to imprint something on you that may not be your truth. If their idea isn’t right for your soil – let it wash away without leaving a mark on the ground. Hold that space for something that will take root and flourish, something that’s in alignment with who you are and what you hold true. This entry was posted in change, clarity, death, legacy on 14 October 2013 by Martina. Death. It’s a tough subject, isn’t it? We don’t often discuss it in our society until something tragic (or expected) happens, and then we lament the past and momentarily feel scared of the future. Death, however, is a certainty. It happens, and it will happen. To all of us. For me, I’ve been surrounded by the prospect of the death of a loved one on and off for over 13 years. That’s a long time to live wondering whether someone you love would leave, when they’d leave, and how they’d leave. In my case, it’s almost a third of my life! And yet, I’ve rarely discussed the subject with anyone, because it seemed somehow out of bounds. Last night I was reminded of this when visiting with old friends. It was suggested that it was somehow wrong to discuss the prospect of dying with others. It was an unnecessary burden to place on another human being, especially someone in a younger generation, like an adult child. I respected their opinion, but I disagreed. Here’s why: Because I’ve been directly faced with the prospect of a loved one dying for some time now, I’ve been able to have the conversation in which I could offer a different perspective. When my loved one recently said to me that he felt he hadn’t done enough, accomplished enough, or been enough – I was able to share that he had, in fact, done more than he realized, that he had been more than he knew, and that he had accomplished incredible things….and I gave examples. If I were to die tomorrow, would I be ok with that? The answer was simply: Yes. I know with absolute certainty that I would be able to say that I died content, knowing that I would be remembered as I would have liked…. as someone who loved well. I may not have accomplished all that I desired, and I may have left unfinished business, but I would know in my heart that I lived according to my values, my goals, and who I am as a person. In my opinion, we can’t ask for much more than that. I know I can’t. So – although it’s a difficult conversation to have, I think it’s important. Not only to discuss with loved ones but also with yourself. And it’s a good yardstick against which to measure how you are living. It’s one of those barometers I’ve talked about. If you were to pass tomorrow, what do you hope would be said of you, and more importantly, what would you be able to say of yourself? If the answer is not what you would hope it would be, what a great opportunity to make changes now so that it will be then. Asking the question is about creating opportunities for sharing, caring and making changes. And I think that’s healthy and, actually, life-affirming. I also want to share that I have every intention of living to a ripe old age, loving well along the way. 🙂 What is your intention? This entry was posted in abundance, clarity, clutter, doubt, empowerment, fear, pause, sharing on 18 January 2010 by Martina. What do you do, when you don’t know what to do? I was recently asked this question by one of my clients. And truth be told, I’ve asked it of myself many times before. It’s more common than you might think. Often times it simply comes in the form of doubt or fear: Fear of moving forward, fear of not moving forward; Fear of making the wrong decision, and fear of making the right decision. Sometimes others provide us with the answer of, simply, “do anything!” But is that helpful? I suppose it can be, but the vagueness of that reply can reinforce and underscore the feeling of emptiness inherent in the question. So, while it’s certainly encouraging – it’s not necessarily helpful. A few years ago, I experienced this feeling of “what now?” and I felt myself going in circles. I tried to fix that which I thought was broken, and the resulting distraction from what was good in my life only caused the good things to be more neglected and ultimately need my “fixing” attention as well. I realized, with help from others, that this was not working, and I paused, shifted my attention, and started to focus on that which was good. Nurturing it, loving it, accepting it. Unfortunately, I had let it go so far, that I was really stripped back to the basics. I spent many days and weeks waking up and simply looking around me and allowing myself to feel grateful for the simplest things: a beautiful tree outside my window, a bird’s song, a smile from a friend, a roof over my head, food on my table, etc. You get the idea. These are the simple things that most of us take for granted, because we have been too busy, or not had occasion to be without. In light of what’s going on in Haiti, this exercise is even more poignant. Oprah introduced the concept of a Gratitude Journal to the world. This concept has been around for a lot longer though. A child’s prayer by his bedside at night is the original ‘gratitude journal’ – whether he is praying to God, Allah, Buddha, etc. What I’m saying is that when we feel overwhelmed by life, and all the chaos and clutter in our minds, hearts and houses – the best way to move forward into peace, happiness and serenity, is to seek out that for which we are grateful, and focus on those things, one at a time. Once our attention is turned, and we can catch a breath or two, we can then take deliberate action, one step at a time, to make changes in our life that will lessen the chaos and disorder. 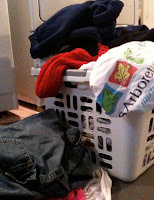 Therefore, instead of looking at a pile of laundry, look at the many clothes you have, and be grateful. Then, do one load at a time – maybe one load a day, until you’re caught up. When it’s all folded and ready to be put away – perhaps there are a few items that you no longer need: items that have added to the chaos and clutter in your life. These are items that may be a blessing to someone else. Could you let go of them? When we are truly grateful for what we have, we sometimes realize that we have too much. Especially in times of need, what a blessing it would be to share our abundance with others. Not only will we be helping someone else, but we will be helping ourselves, too – by taking steps toward preventing a future uprising of that “what now?” feeling. It all begins with your decision to pause, and choose a different perspective. And isn’t that just amazing? That a feeling as overwhelming as “I don’t know what to do,” can be transformed into empowerment within a few seconds, simply by pausing, looking around you and allowing yourself to appreciate what you already have, and what you already have done. What a gift. Never miss a moment of inspiration... Sign up here to receive InspireBytes™ in your inbox! © 2009-present Martina E. Faulkner. All Rights Reserved.